ppm factum is traditionally a proud partner of The Choice of Consumers award which is held by Atoz group every year. This year awarding was placed into modern Hybernia theatre and ppm could not miss. 48 winners were awarded during the ceremony evening – consumers themelves were judges and were deciding in several categories. 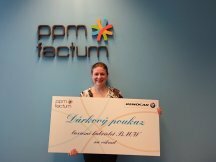 ppm organised competition to support the awarding – the prize was luxury convertible BMW for the weekend.The happy winner was Mrs. Ivana Podojilová from Assorta company. ppm thus wishes mainly sunny weather and pleasant experience. The photodocumentation of the ceremonial evening will be launched soon.